I’ve talked up Gygor so much since he was revealed earlier this year at Toy Fair, there was no way my review, eagerly anticipated by many of you, was going to do justice to him. I toyed with ideas like making some sort of mock-toy commercial, but I don’t have the kind of A/V equipment required to do that (though I do have a friend who might be able to help…but I only thought of that a second ago). So, my apologies for not having anything more momentous than a standard review to celebrate his arrival. I love gorillas. Like great white sharks, alligators, and Komodo dragons, gorillas are living monsters–but they’re good monsters, the ones on us mammals’ side (more or less). What’s more, gorillas weren’t really known to exist in the Western world until the mid-1800s, before which they were simply tales brought back by the occasional adventurer of large hairy man-like beasts roaming the Dark Continent. They were Victorian England’s version of Bigfoot–except they were real. While we’re discussing history, let’s talk about Gygor’s. 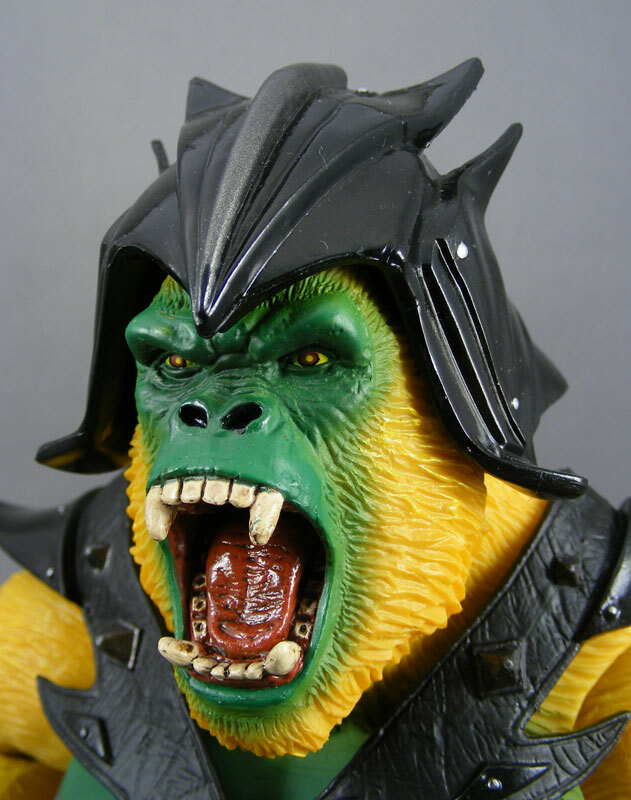 Gygor was never actually produced for the original 1980s Masters of the Universe line. He only existed as a prototype. 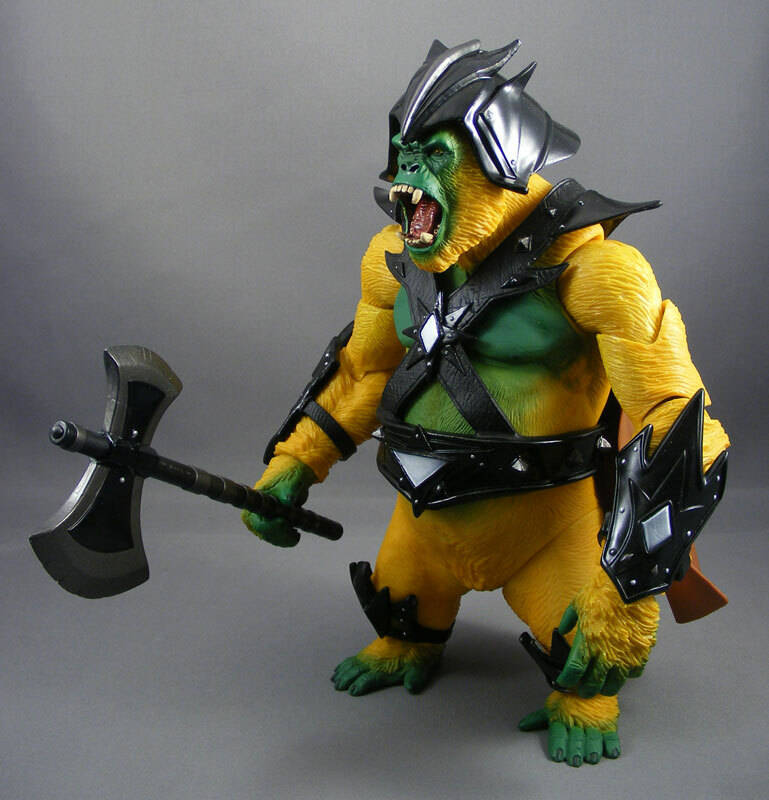 I first became aware of Gygor’s existence when reading Roger Sweet’s account of his time at Mattel, Mastering the Universe, and I instantly wished that young Poe had had the opportunity to play with a big yellow armored ape wielding a battle axe. 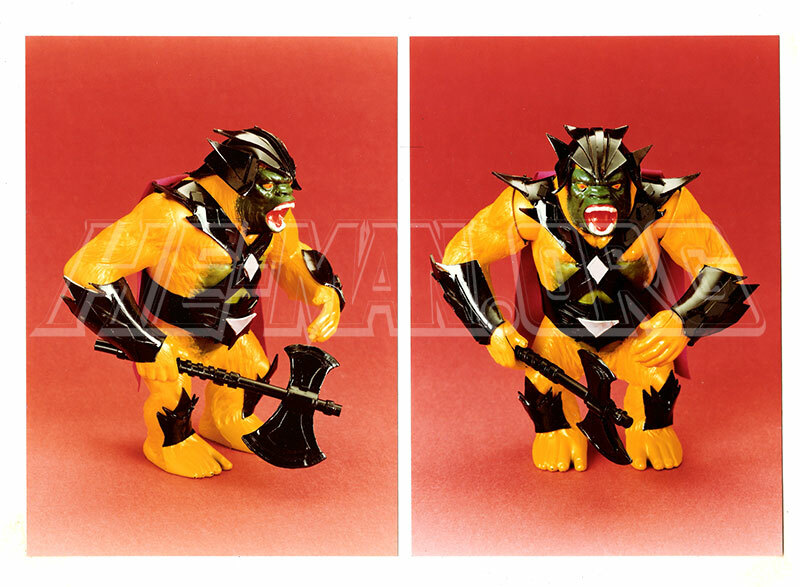 Like Battle Cat, Gygor was a repainted animal figure from Mattel’s 1970s Big Jim line. There were supposedly later revisions to the figure that featured a saddle for figures to ride on, but personally I think the version above is preferable. 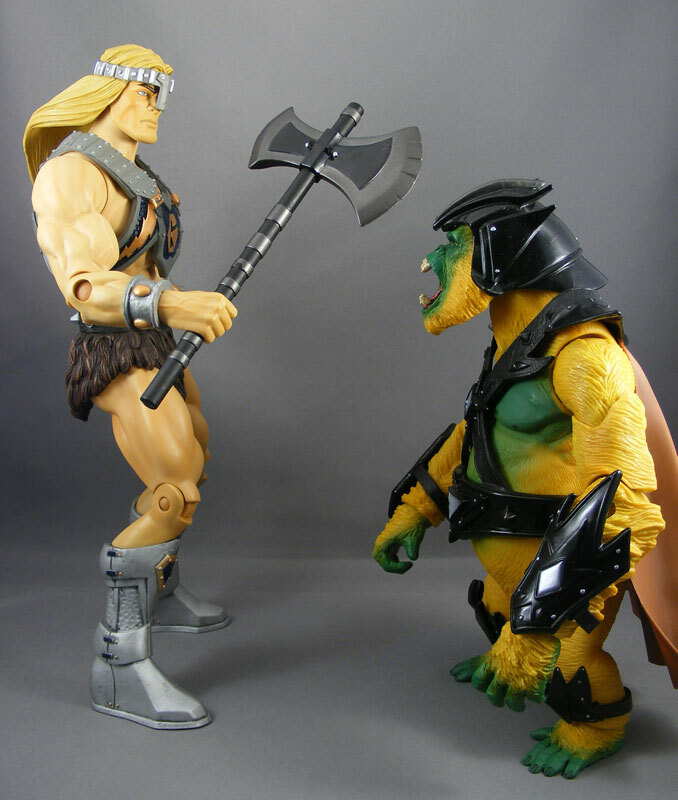 In raiding the Mattel vaults for material for Masters of the Universe Classics, Mattel came across the original Gygor prototype photos Mattel was later given the above prototype photo by Emiliano Santalucia of He-Man.org. At this point, Gygor had gained some minor notoriety among He-Fans, but it would be false to say fans were clamoring for Gygor. I certainly was more than ready for one, but there were plenty of fans who were mystified by his appearance at Toy Fair in February. Of course, we now know (as many suspected) that Gygor was also a way to get at least two uses out of one mold–i.e., the Shadow Beast. Packaging: Like Tytus, Gygor comes in a giant window box that shows off the figure well. The axe is nicely positioned behind him. Regarding the bio, y’all know I hate the idea of Gygor as a bad guy, but I’ll get to that when I do his bio discussion. Design & Sculpt: There have been much discussion as to whether any part of Gygor is a reuse from Gorilla Grodd. I don’t care whether that’s true or not, and because it has no bearing on the quality of this figure, so I’m not going to discuss it further. 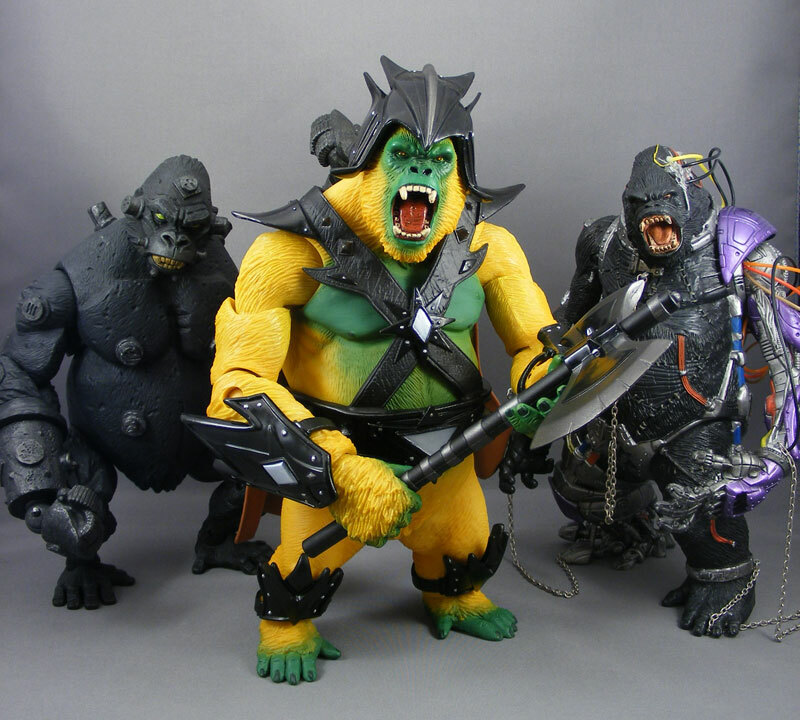 I’ll only say that the Four Horsemen have sculpted gorillas before, and there are a lot of similarities between their sculpts for Cy-Gor II, Grodd and Gygor. Gorillas is gorillas. In any event, the sculpting for Gygor is superb as always. Some MOTUC fans may find that the high amount of detail on Gygor makes him look a bit out-of-place next to other MOTUC figures, though I think that may be partly a result of the simplicity of the earliest MOTU designs. Put him alongside Whiplash, Count Marzo and Chief Carnivus, and I think he fits right in. He stands just under 10″ tall, and is a couple inches shorter than Tytus. Gygor’s mouth is sculpted in an open, roaring fashion, and the detailing on the mouth and teeth is particularly good. Generally I hate open-mouth figures, but I’ll admit Grodd’s closed mouth was almost a little too mellow for an action figure. The Horsemen were basing their sculpt on the original Gygor, so the roaring mouth was a given, and I think it works. The armor is all removable, though the arm and leg armor do not have buckles, so you have to slide them over the hands and feet, which will require some agonizing stretching of the straps, so you run the risk of the straps becoming too loose. I removed them once for the pics and I don’t plan to ever do it again. The chest armor does have a buckle in the back, and Gygor’s head pops off easily to aid removal. If you look at the prototype, the Horsemen have closely based the look of the armor on the photos, so this is truly a Classics-ized version of what a vintage Gygor might have looked like. Plastic & Paint: Gygor’s torso is rotocast, and I believe his legs are too. But it’s a very thick, strong rotocast, and the plastic was able to hold the detailed sculpting of the fur very well. The head, arms, and feet are injection-molded in yellow, and while it’s a strong yellow, it’s not too bright or cartoonish–in my opinion, at least. 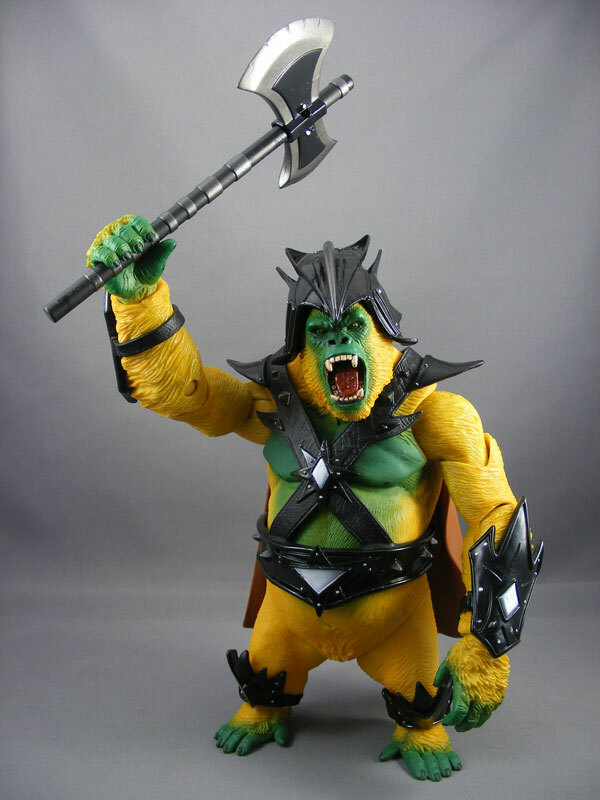 The paint work on Gygor is very good–higher than we usually see on MOTUC figure. Just check out the work on the mouth in the top image of this review–they even painted the pits of his molars. The parts where the green skin fades to yellow fur are fairly well executed, and there’s some nice dry-brush work on his fur. 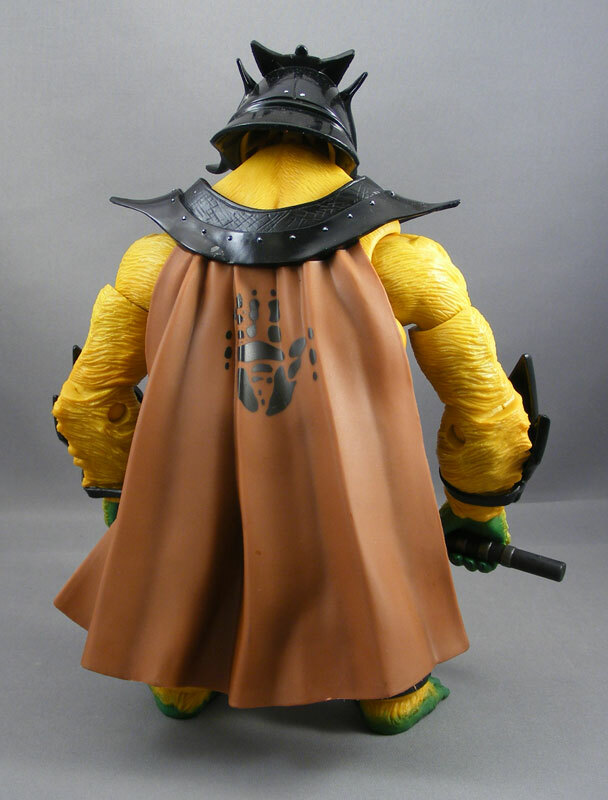 The back of the cape features the odd “gorilla hand” symbol, which I suppose must represent Gygor’s tribe. Or maybe he was trapped on a desert island for a while and all he had to talk to was his cape. I know a lot of collectors are disappointed with the cut thighs, but working in ball joints for the hips would have both ratcheted the price up to the $40 range and probably have ruined the sculpt quite a bit. While it would have been great to have an ape figure that can actually realistically walk on his knuckles, I’m not disappointed by its lack here. The one joint I would have liked to see is ball-joint wrists of some sort. It would have added just the right amount of posing possibilities, especially with the axe. Accessories: Since I’m counting his armor as part of the design & sculpt, the only accessory is his axe–which is, of course, badass, and has the added bonus of fitting perfectly in Tytus’s hand. Quality Control: No problems, but as I said, be careful taking the armor on and off. Overall: I have a hard time understanding an action figure collector who doesn’t see the appeal of an armored, axe-wielding gorilla. Jack Kirby would have loved this guy. I know a lot of people are turned off by the yellow-and-green colors, but to me that just screams MOTU. It’s the touch that makes this a Masters of the Universe toy. And at $30, he’s much better priced than either the regular figures–which have so much re-use–and Tytus, who had less articulation, was almost entirely rotocast, and had a far less cool weapon. I can see a figure like this selling at normal retail for about $25 in today’s market, so we’re basically just getting the usual $5 “designer” cost for a Mattycollector item. Still, between that and the lack of ball-jointed wrists, Gygor doesn’t quite get the 5-raven score I’m sure many of you were expecting. Still, he’s an incredible action figure, and choosing a favorite this year–a year with Battle Cat and Trap Jaw as well–is going to be tough. I definitely hope we see Gygor's axe rereleased in some future weapons back in a silver and brown paint scheme. Tytus looks so much better with a decent weapon. Poe, I love you for that one! It's about time. 🙂 Nice review. Were you disappointed in anyway with him Poe? I had have been very please with him, but then I had very low expectations. I do differ with you in that I love him as a bad guy. If he was a good guy, I'm sure I wouldn't be enjoying him as much. That is cool about the axe and Tytus. I love all of the photos, and as always your MOTUC reviews are the ones I trust. once I make my fortune as an oil man I'll get caught up on MOTUC again, I swear. One thing not mentioned that I'm noticing with my Gygor is that he's not very well-balanced. I've already had mine fall over twice in poses that appeared perfectly steady, only for him to collapse hours later. It may be that if the feet had been just a tad bit larger, he would have had a more solid foundation. As it is, he's very limited in posing options because many poses will result in him just falling over at some point. And, in my case, that also meant taking down the majority of the villains shelf along with him. Other than that though, he's a fantastic figure. @Poe: "But it’s a very thick, strong rotocast…"
dude, not to call you out here, but to call you out (;)), i completely disagree w/ you here, and so did pixel dan… as his did, mine's torso squeezes, like a bottle of ketchup. while it did take detail well, the grade plastic used for gygor feels fairly flimsy to me, and not nearly as durable as his smaller counterparts. his forearms will also bend if you torque them a tad, and the ease w/ which his head pops off is creepy. he certainly has some fun details, and he's a big golden and green gorilla, nothing wrong w/ that, but on the whole, i felt a little ripped off w/ gygor, and am happy to be passing on the shadowbeasts, big mean animals though they may be. the axe is the only thing about gygor that to me seemed like what i expected for my money. the ball ankles are a joke w/ neither knees nor proper hips, so i don't give credit for that bit of artiuclation either. they as well have been cut swivels. the big joint i was looking for would have been a waist. I have to admit, I didn't have the same love for Gygor at first. I thought he looked cool, but he just didn't do much for me. Even watching Pixel Dan's review couldn't sway me one way or the other. I opted to pass on him on the Matty Sale day, and I felt pretty comfortable doing so, saying to myself I was saving money for stuff down the road. Of course as soon as some of the reviews started coming out, I changed my tune completely. I knew that once I read Poe's review, it would be the final nail in the coffin. So anticipating this, I was lucky enough to find a chap who had an extra to sell him to me for cost plus s&h, so I think I made off pretty decent. He hasn't arrived yet, but I'm actually very excited to get him now! 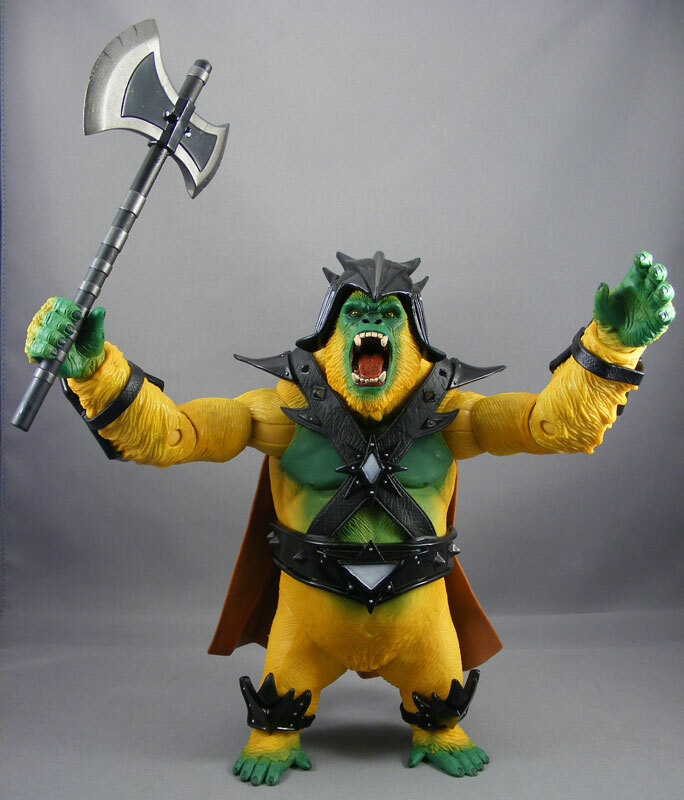 Seriously, Gygor is proof that some traditionalist-MOTU fans are so myopic that they will never allow themselves to like a great figure if it wasn't part of the original series. 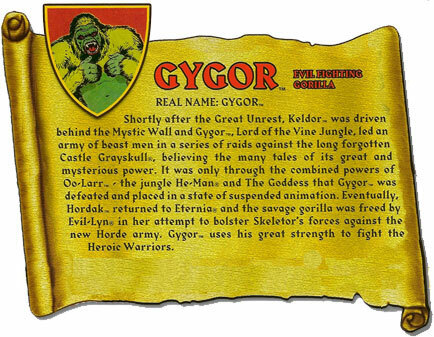 Had Gygor been in even 1 episode of the filmation series, even in a cameo, I can assure you he would have sold out in 15 minutes. Battlecat vs. Gygor for figure of the year. @Damien: My Gygor is rock-solid. Never even come close to falling over. Then again, I'm not really going wild posing him, but as long as both his arms aren't straight out in front of him, I really don't foresee a major balance issue. @dayraven: You're right that the ankles are ball/hinge…but just barely. I hadn't noticed that. As for the torso–call me out if you want, but I still disagree. I don't know what the deal is with your Gygor (or Pixel Dan's), but mine is solid. It takes quite a bit of pressure for me to squeeze his torso. I just tried it again to be sure, and yep, it's very resistant to pressure. Michael Crawford also said he was "very sturdy, and you should be able to handle him without fear." Gygor feels very solid to me. Not sure how we can come to such different conclusions, but there it is. @Poe: if you say so, i believe you poe… but that would mean the QC on the big badass is VERY rough… mine literally squeezes like a full bottle of ketchup. @Poe: It may be an issue with the ankles. Mine aren't super-tight, so that may be contributing to him tipping forward. But if I put either his arms out in front of him, he starts to tip. Now I have him with his axe held over his head and his other arm at his side. He seems fairly stable in that pose. @dayraven: I also haven't had a problem with Gygor's torso. Mine's solid. So maybe a QC issue? My Gygor is also very solid. Honestly, if I hadn't head he was rotocast, nothing about the feel of the figure itself would have tipped me off. I'm squeezing him right now as hard as I can and there is very little give. My Gygor is stiff, I tried squeezing him with my own monster ape hands, and I could barely dent him. I was surprised, since I had seen Pixel Dan's review. I wouldn't have cared since it doesn't affect the functionality of the toy, but it's an issue if the same soft plastic is making the head pop off too. My Gygor's head seems like it will break if I yank on it. It's got to be inconsistent plastic mixes, or possibly different climates affecting him. The arms seems rotocast too, just because they're made of a similar plastic to the rest, like all of those phony movie "toys" you'd always see from Applause.. He holds his axe fine, but if I leave an elbow or bicep in exactly the wrong position, the arms may fall down an inch. The joints are flirting with being loose, at least with a huge axe in hand. I'm not big on none of the armor or helmet being all that secure, but its not awful. 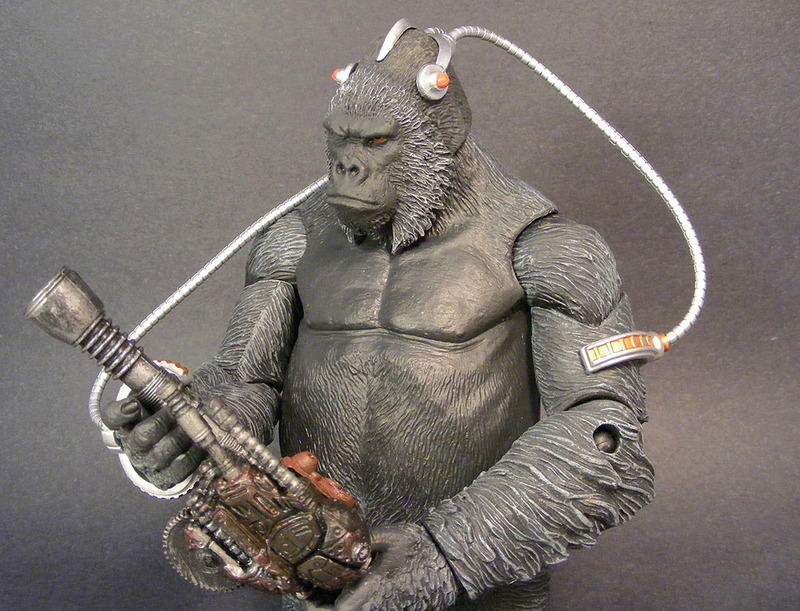 Still, huge crazy gorilla, awesome sculpt, unproduced curiosity…well worth every penny to me. Sometimes with rotocast stuff, if it has a hole in it, even a pin hole it can be squeezed. Those who can squeeze it may have that. While those who don't, have a more solid feeling piece. Hey, jsut an historical correction. Mattel never found the photo of the prototype in their archives. Up to 2008, they were not aware about Gygor at all. 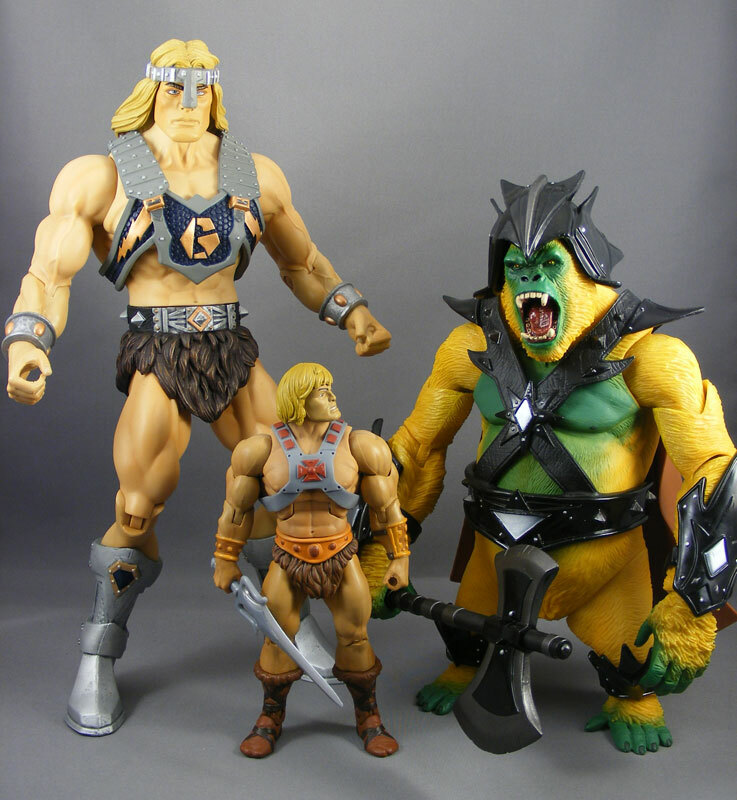 We then decided to put the pic on He-Man.org to create some hype for the upcoming figure. Thanks for doing that Emiliano. A very cool contribution on your part. Emiliano, the man secretly responsible for tons of fun details we're seeing in MOTUC. He seems to be a walking He-Man archive. Meanwhile, Hasbro loves him more than Mattel does. Weak. I hope Mattel is open to more of his input. He should be getting paid just to stand around knowing stuff. I like what you're selling, and I'd like to know more! Great review,Poe,not as exciting as a battle-cat review,lol.I kinda like the original mold,his lack of detail has some charm. I for one love my giant Gorilla 🙂 I'm waiting to see a Grodd repaint out of the larger mold. Has anybody seen one yet? I bet he'd sell if matty decided to run with it. Hey Poe, thanks for that! I wish I could stop more often too, but I guess the .org takes too much time from my working schedule already. Who is the gorilla on the left in the last photo? Looks Hellboy-inspired….